Synopsis: Behind the music of Nashville lies a captivating web of betrayal, heartbreak and rivalry. Rayna Jaymes is the reigning Queen of Country, yet hot young diva Juliette Barnes is poised to knock her off her throne. Adding more fuel to the fire is Rayna's rich, scheming father, whose political ambitions for Rayna's husband hide sinister ulterior motives. Surrender to a seductive mix of music, intrigue and passion with Nashville: The Complete First Season , including all 21 tantalizing episodes, and exclusive, never-before-seen bonus features, in a spectacular 5-disc set. 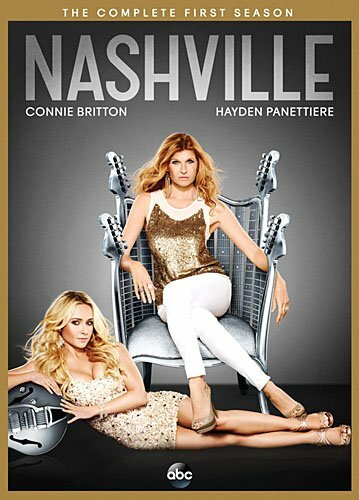 Talent/Cast: Nashville was created by Callie Khouri and stars Connie Britton as Rayna Jaymes, Hayden Panettiere as Juliette Barnes, Charles Esten as Deacon Claybourne, Eric Close as Teddy Conrad, Clare Bowen as Scarlett O'Connor, Jonathan Jackson as Avery Barkley, Sam Palladio as Gunnar Scott, Robert Ray Wisdom as Coleman Carlisle and Powers Boothe as Lamar Wyatt. Bonus Features: "Nashville" Comes To Nashville - Follow the cast as they take a tour through the soul of "Music City" by exploring the legends and historical locations that make the show truly authentic. On The Record - The "B" Side - In an expansion of the popular On The Record series, fans will get the inside scoop into some of the stories told by the talented writers and musicians who create the music that is the heart of the show. The Stellas Go On "Tour"- Get a closer look at the show through the eyes of "Nashville's" adorable and real-life sisters, Lennon Stella (Maddy) and Maisy Stella (Daphne). Deleted Scenes - Experience even more compelling drama through these unseen moments from the hit series. Bloopers - Laugh your heart out with never-before-seen outtakes from the set.